Kyle Lang officially took over the executive directorship of Canby's Area Chamber of Commerce on April 23, although he'd already been spending some time at the Chamber office the previous two weeks. 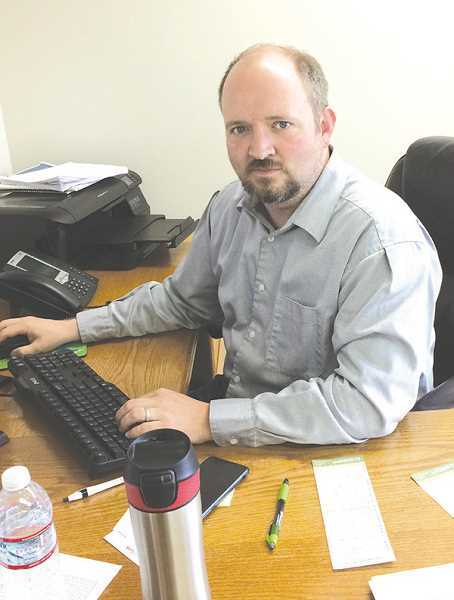 The man who was born and raised in Canby is "really excited" to take over the Chamber's reins and has plans to get going as soon as possible. In fact, he spent three or four days ahead of his official start date to take care of administrative duties and start learning about how the chamber works and its culture. That allowed him to jump in with both feet on April 23. He's spent the past number of years working as both a teacher and general manager for Wild Hare Saloon. "I've worked at Wild Hare in Canby for 14 years and for the second one in Oregon City for 2½ years since it opened," he told the Herald. As general manager of both saloons he took care of "scheduling, hiring, firing, floor managing, coordinating, operations and event planning," including helping set up this year's Hare Fest. He also made sure the food and drink recipes were the same at both businesses. "I've worked more than one job since 2007-08 when I taught literature and writing at Pacific University, Portland Community College and Clackamas Community College and worked at the bars. Both very different activities. Teaching is a cerebral, mental activity, while the bars fulfilled my social and physical needs." The new job is a left turn, he said, but as well it's a full circle. Earlier, when he was tired of teaching he met with an aptitude counselor who told him his major talent was to direct an organization. When the job was first announced, Lang said, his family and some members of the community came to him, suggesting he try for the job. "I guess they saw my aptitude, and I'm a known quantity since I've been in Canby all my life and I know a lot of the people in this town. My family is happy that I'll be working full time and be home at night, especially my daughter." Lang and his wife Tracy have an 11-year-old daughter named Shea. He has lots of plans to begin the job. He plans to work on bringing in new members by expanding services. These include educational programs dealing with issues such as legislative and administrative changes and regulations for business whether it's small or large. "My vision is being bigger, stronger and more engaged while providing a greater amount of service," he said. An important part of his job, he said, is to listen and hear what current and new members want. He wants to be able to relay information and how to use it, whether it's about regulations, payroll or taxes, he said. "I want to offer our members information on better ways to operate their businesses, including small and homebased businesses. I want to be a resource for them, socially, and to teach them the pitfalls before they fall victim to them. I want to be a partner and a mentor." The listening tour also will be thoroughly used with current members. "I want to reaffirm relations by connecting to the existing base; to find out what is working [for them] and what isn't. By listening I can learn what I can do to be of service and value to them." It's too early to announce any changes, he explained. The listening tour he wants to make will provide him the information he needs to make changes in the future. But currently he said he has no idea where and when any changes will be made or how they will be made. As for politics that is all part of the work, he said. "As long as people are being honest, trustworthy and accountable it's okay. I will have to deliver and execute. It's a member organization and different people have different points of view. In addition, my boss is a board, which makes my job an interesting challenge. And I love challenges," he added. He sees another important part of his job as building consensus. The Chamber holds a series of monthly meetings such as monthly luncheons on the first Tuesday of the month. There also are Good Morning Canby meetings the second Thursday of the month, Different businesses host these 7:45 a.m. meetings, which feature a different subject and time to mingle. "It's like a coffee and a network in one where members can learn what's happening," Lang said. Yet another part of his job is building tourism. "I think that's a part of the mission -- getting tourists to come to Canby and linger longer so they spend more money, see more features -- new and historical, and come to the Dahlia Fest, performing arts, the ferry, which then brings them back. "Basically this job has a variety of tasks and requirements. I think every day will be different and full of challenges," he added. "Most of all it is providing services to our members and the community. I was raised here and my family has always served the community. My grandfather was mayor of Canby. My uncle was a city council member, my father was president of the Canby High booster club and my mom was on the historical committee." Lang is a graduate of Canby High School, he received his bachelor's degree from the University of Montana at Missoula. He also received a Masters of Fine Arts at Pacific University of Oregon in Forest Grove.